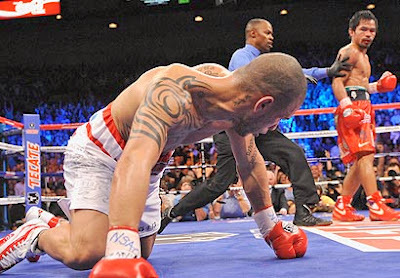 Manny Pacquaio won the welterweight title via technical knockout on Puerto Rican Miguel Cotto. Referee Kenny Bayless stops the fight in 12th round. Cotto's face looks worse with blood pouring from cut by Cotto's eye. Manny Pacquiao is truly boxing's pound-for-pound best. Manny made history because no man has won seven world titles in seven weight divisions. He is still the King.